PALLET FACILITY – John Rock, Inc.
John Rock Inc. America’s Premier Pallet Manufacturer is one of the largest single location manufacturer of pallets and crates in the United States. Our state of the art 120,000 sq. ft. building located in Coatesville, PA has eight automated nailing machines capable of producing in excess of 100,000 pallets a week. We operate three heat treating kilns. We have the ability to not just heat treat but to dry pallets as well. 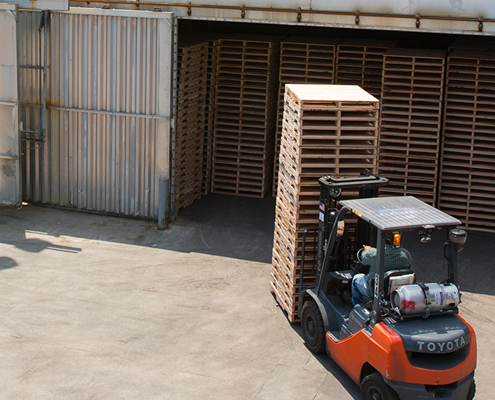 We treat between 12,000-16,000 pallets a day to comply with ISPM 15. 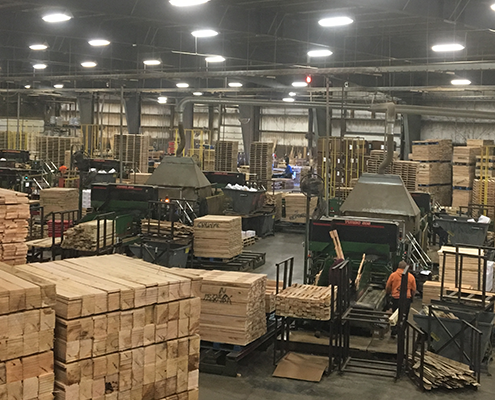 The plant has five sawing lines that cut 1 million board feet of lumber per week along with 60,000 sq. ft. of indoor warehouse space for stocking. John Rock manages our own fleet of 48 trucks and 250 trailers that service the Eastern corridor from Virginia to Massachusetts. All of this allows us to deliver high quality products at a competitive price. Consistently achieving the highest level of production is only possible with the right building and the best equipment. John Rock, Inc. has forged relationships and aligned ourselves with recognized leaders among every aspect of the wooden pallet industry including: high volume cutting, new pallet assembly, heat treatment as well other cutting-edge pallet related technologies. The John Rock production team possesses an impressive lineup of equipment, representing the most advanced state-of-the-art technology and design anywhere. A number of manufacturers recognized an opportunity to house such quantities of equipment for one operation in one single location. To that end, this “Welcome” sign was installed to demonstrate this real-world showplace to prospective customers, so they might witness first-hand for themselves what is possible at the very edge of the envelope in high-volume production. The saw room is where efficiency begins. 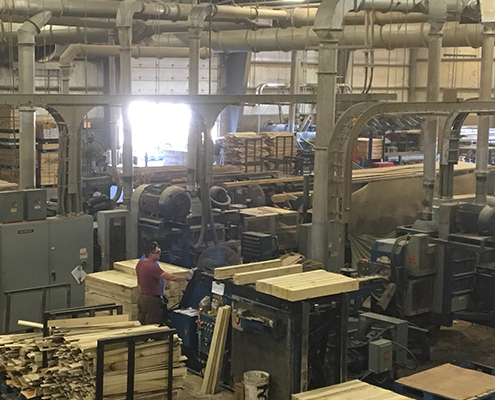 Our facility features 5 custom sawing lines that can cut 1 million board feet of raw material lumber per week as well as an automated 4 way notching machine that can notch 5,000 stringers per hour. Each line features automated stackers to improve sorting, sawdust removal and speed. Three of our saw lines are set up with a gang saw and a band saw on the same conveyor. We are able to trim cut, plane, and split material all on one line. This set up give us the flexibility to receive multi dimension cants and boards from our mills. Two of the five lines offer the ability to make combo cuts, sorting two different lengths of material coming off the line. The saw room has two dust collection systems that are attached to each saw line feeding large collection bins that are housing 300-500 cubic yards of sawdust to be recycled and repurposed daily. We have 8 nailing machines capable of producing over 100,000 pallets per week. This is one of the largest collections of automated nailing machines under one roof in the United States. Our high speed machines give us the capability to make stringer pallets, block pallets and combo pallets utilizing recycled and new material. These automated nailing machines have the flexibility to nail as large as a 72 x 60 pallet down to the smallest size of a 20 x 20 offering an efficient competitive option for our customers. Pallet branding and stenciling are custom options that can be done with ease on any of the nailing machine lines. Heat Treated Pallets / ISPM 15 Compliant Pallets / Export Pallets If you ship your products outside the US, the pallets you use will be required to comply with the International Phytosanitary Measure known as ISPM 15. Compliance involves “Heat Treating” pallets to reduce the risk of introduction and/or spread of quarantined pests. The John Rock facilities have the two largest heat treatment sterilizers in the country. They are poised to handle even the largest pallet users needs quickly and efficiently. You can rest assured that John Rock stands ready to handle whatever your needs are. What could be more environmentally friendly than that?